This colorful but bittersweet Victorian trade card measures roughly 3 inches by 4½ inches. 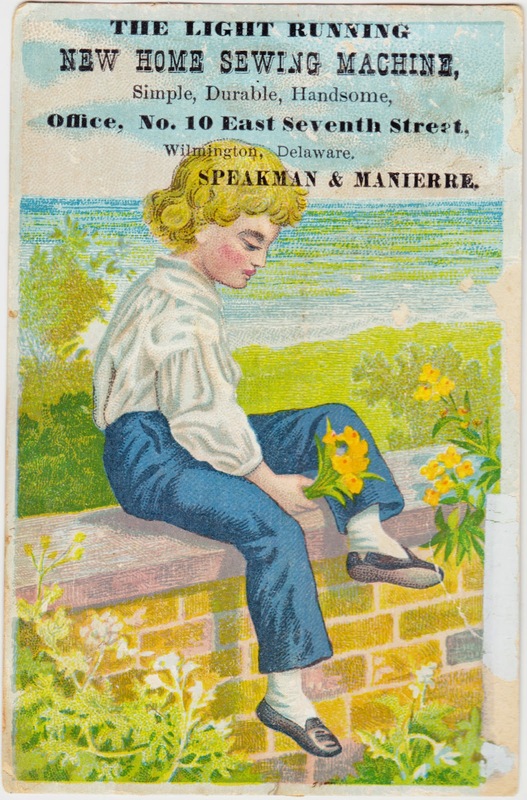 Of course, a young boy sitting on a wall and looking forlornly at the flowers in his hand has nothing to do with selling sewing machines, but that was par for the course for Victorian trades. It was memorable enough that nobody ever threw it out! And now it has far, far outlasted Speakman and Manierre, whoever they were. There is a Delaware-based plumbing-supply business, Speakman Company, that was founded in 1869 by Allen and Joseph Speakman. But I cannot find any mention of a person named Manierre who was involved with the business. Nor do I think Speakman was ever involved with the sale or manufacture of sewing machines. So the actual company manufacturing this item was called The New Home Sewing Machine Company, and it was located in Orange, Massachusetts. You can read more about the company's history in a wonderfully illustrated post by Alex I. Askaroff, in this post by Kate Miller-Wilson on LoveToKnow, and from a 1997 article titled "The Men Behind New Home."